Please support them – and buy a Legend while you at it! The photo (courtesy of Gary Mackley-Smith) is a scene from The Legend’s Creative Devon Launch back in October, which was a great event. It shows me sharing a joke in the library before the event started. On the right is Imogen Hallam, who painted the cover of The Legend Of Aranrhod, Priscilla Trenchard who made a book of all the artwork which people did during the event, and Rob Millar the puppeteer of Monsieur Moustache, who did a workshop in the chapel. The ‘Your Feedback’ page on the right has a new review, which begins: “This spiritual thriller for teens is more exciting and better written than The Da Vinci Code.” (Of course, it depends what you thought of Dan Brown’s blockbuster …) Have I found here The Legend’s genre at last – ‘spiritual thriller’? I’ve never heard the expression before. Have you? What do you think of it as a description of The Legend Of Aranrhod? Finally, on the Far & Wide page, I’ve added Scotland. And Lake Forest, Illinois. If you’ve got a copy of The Legend Of Aranrhod, is your location already listed on the Far & Wide page? PS – There’s still time for you to order a copy of The Legend before Christmas. Obviously, the book won’t arrive before Christmas now, but your order would! No but seriously, it depends whose Calendar you go by. In some continental countries, and throughout Russia – a pretty big place – they celebrate the Day on January 6th, so copies would arrive before (their) Christmas. And anyway, how nice for a friend or loved one to receive an extra gift in those awful days between the 25th and 31st December, when the let-down has set in, they’ve eaten all the Thorntons, drunk all the 10-yr-old port they got in, and they’re surrounded by unwanted gifts (including yours) which they don’t want to return until the Sales begin. Imagine their pleasure when there’s a ‘thud’ on the doormat and inside a Jiffy bag is a book guaranteed to uplift their spirits and keep them away from toxic telly for a few hours at least – they may even decide to keep your original prezzie and not replace it with something they want! Just added Belmore, New South Wales; Pittsburg, Pennsylvania; and Stockbridge, Massechussets, to the Far & Wide page on the right. So don’t forget, if you have a copy of The Legend of Aranrhod and your country, state, county, city, town or village is not recorded on the page, mention it in a Comment so that I can add it. Last week, the editor of The Church Times, Paul Handley, recommended The Legend Of Aranrhod to his readers in the paper’s annual Christmas Books supplement, by explaining that he had read the book to his own children, who had eagerly awaited the nightly instalment. … which, as any shopper worth their club points will know, means Buy One Get One Half Price. 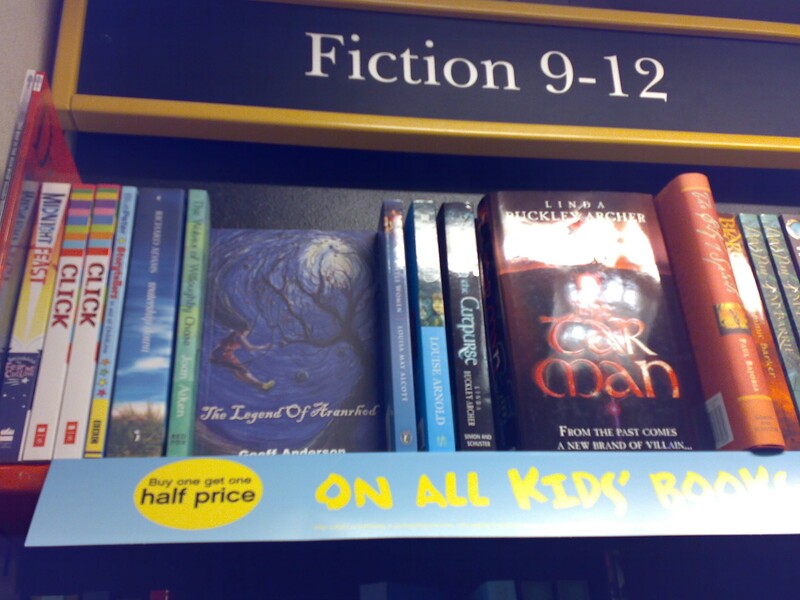 Now you simply cannot afford NOT to go into the Worcester High Street branch of Waterstones and buy TWO copies of The Legend Of Aranrhod OR, fair enough, buy one copy of The Legend and a copy of another Children’s Book so marked with a sticker on the shelves. The poster on the wall next to the shelves is a poster advertising The Legend. I’m still waiting for somebody, anybody, to send me some pics from the Creative Devon Launch which took place on Sunday 14th October. Over 60 people came and had a great time. Some excellent artwork was produced, which will at some point be posted on the Farringdon Society of Arts website, www.fsadevon.co.uk. I’ll tell you when it’s on. On the right I’m planning three new pages called Far & Wide, Unusual Readings, and I Told My Cousin Wilbur. Ive managed to start the first one, while the other two will follow in the next few days. Far & Wide is an attempt to keep track of where copies of The Legend have ended up – the countries, states, cities, towns, villages, hamlets, neighbourhoods, prisons, etc. Please write in the comment window such places that you know of and I’m going to get a map and some coloured pins. Does anyone know of an online way of doing that? A map of the world and a map of the UK which would take markers of some kind. Unusual Readings is, as the title implies, a more unusual page. It is looking for anyone who has read the book in an unusual place, or in unusual circumstances. Now, this doesn’t have to MADLY unusual, like on the space shuttle or the summit of Everest; slightly unusual would do – a transatlantic flight or the summit of Snowdonia. The smallest room in the house is not an unusual place for reading, but if it were a really unusual smallest room … And how about some stories of unusual consequences arising from reading the book? Unexpected encounters. Missing an appointment. Getting the sack. Meeting the love of your life. Changing your life’s course (a book did that for me once). I Told Cousin Wilbur – Besides YOU being affected when you enjoy reading a book, other people are affected too. Siblings, parents or children may be queueing up to read your copy (how annoying when they keep popping their heads round the door to ask what chapter you’re on!). But what would be most interesting here is who you recommended should buy a copy – not their names, obviously, but your relationship with them, eg neighbour, friend, work colleague, teacher, schoolfriend, relative. Not everybody follows through on such recommendations, and that’s not important here. But whether you recommended the book to someone – maybe several people? – is very important and it would be good to have a record of that on this page. So we see the ripples spreading out, even as far as Cousin Wilbur. At 2 o’clock tomorrow, in a Devon location, 60 people will spend 3 hours talking about The Legend Of Aranrhod, drawing it, chatting to a French puppet about it, learning about the business of self publishing, and making a book of the Launch itself. A veritable symposium. Half of the people will be children. Next week I’ll tell you how it went, and hope to have some photos. Meanwhile I’ve attached a photo of The Legend on the bookshelves of a Waterstones bookstore, a milestone in its journey to the stars. We know the book is being enjoyed by a much, much wider age-range than 9-12, but bookstores have to categorise to bring some order to their stock. If you live in Devon and would like a copy of the book, you can buy one in the Exeter branch of Waterstones near to Boots’, or from Paragon Books in Sidmouth, or Cameron’s Bookshop in Cullompton. If you’d like a poster promoting the book, let me know. If you live in Devon and are connected with a school in the county, why not invite me (or get me invited) to give my Interactive Talk to Years 5 and/or 6? It lasts between half an hour and an hour, according to what the school wants. I bring simple costumes and props and involve a couple of dozen children in the action. It’s not a monologue! I can be contacted about this and anything else at GeoffAnderson@ideas4writers.co.uk. Thank you. More than one person has suggested to me that the whole story is a dream. Well, it might be. I mean, that is a fair interpretation. I like stories that can be interpreted on different levels, stories that have different layers. Check the Carys page in the sidebar for another interpretation of the story as a rite of passage parable, a glimpse into the mysterious and, to some, frightening passage where we leave childhood behind. If you’ve not read the book yet, you may not want to read the Page because it does mention elements and events from the story. I found Rob Millar’s Comment in the Spam Filter a couple of days ago. It had lain there since July 29th. At last it is seeing the light of day again. It is an interesting comment which looks at The Legend through the eyes of a reluctant child reader and an avid child reader. Now that I’ve learned about the spam filter, I shall check its contents regularly so that this will not happen again. See ‘Your Feedback’. Not to be outdone by Worcester, Exeter Waterstones – the branch next to Boots – is going to stock The Legend Of Aranrhod. So the good people of Devon, who will be excited, alerted, and bowled over by all the publicity about The Legend arising from the Creative Devon Launch at Bishops Court, Clyst St Mary, on Sunday 14th October from 2-5, will be able to dash into the city, find Boots (everyone knows where Boots is), and rush into the Waterstones nearby and BUY A LEGEND. Or two. But DON’T rush into the Waterstones branch near the Guildhall, for they are NOT stocking The Legend, thank you very much. In fact, if you so much as ask if they DO stock it, you are liable to get a stale sarnie hurled in your direction. … BUT only if you live in Worcester or environs! Yes, the High Street branch of Waterstones, Worcester, is stocking The Legend Of Aranrhod according to their policy of supporting local authors. Indeed they’re going to put a sign under the book saying Local Author. Frankly, they could put a sign up saying ‘Trash’ and I’d be happy because ANY sign attracts the browser’s attention, which is paramount in a bookstore with thousands and thousands of titles. It’s been ‘outward-facing cover’ this week but I reckon for not much longer – I tremble to think what that six inches of shelf real estate is worth. But I imagine The Legend’s shelf-life will be pretty short even when it’s taking up a mere 18mm of shelf-space with only the spine showing. If you were thinking of buying a copy as a Christmas present for someone, it would be nice to show your appreciation of Waterstones’ Local Policy by popping in and making your purchase at the High Street branch. A bit tricky if you live in Leeds or Folkestone, but maybe a local person could buy it on your behalf? Meanwhile, half the 60 invitations to the Creative Devon Book Launch at Bishops Court, Clyst St Mary, have gone out, and a shortlist for the other 30 is currently being drawn up. Is your name there? Is your name even in the hat? It will be an event not to be missed, on Sunday October 14th from 2pm to 5pm. Write to me at GeoffAnderson@ideas4writers.co.uk.